Like to listen to music while you're on the john? Are the speakers in your room or living room too far away from the bathroom? 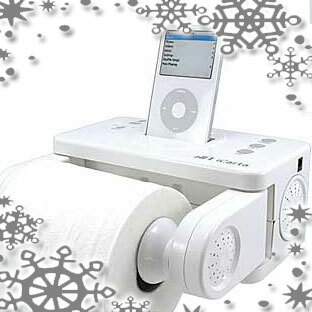 The iPod Dock & Toilet Paper Holder may be what you need. The iPod Dock & Toilet Paper Holder allows you to dock your iPod in the Toilet Paper Holder and listen to your favorite MP3 player while in the bathroom. It has moisture-free speakers that deliver clear audio for your enjoyment.